At Syracuse Orange Jim Brown was All-America in both football and lacrosse and a letterman in basketball. Jim selected football as his career sport however and thus became the Cleveland Browns number 1 draft pick in 1957. 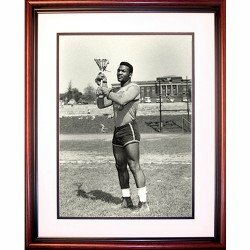 This 16x20 ginned framed photo of Jim Brown playing Lacrosse come with a cherry wood finish and white matting.